Advantech, a leading embedded computing provider announces its latest IoT gateway aimed at empowering industrial IoT solutions by UTX-3117 fanless & extended-temp embedded box. The solution uses the latest Intel® Atom® E3900, Celeron® N3350, and Pentium® N4200 series processor technology to provide a real-time IoT computing, power-efficient, plug & play gateway which is ideal for smart city street lighting, smart metering, smart parking, smart agriculture, HVAC, healthcare, industrial automation and more. UTX-3117 is compatible with Microsoft Windows 10 IoT Enterprise, Yocto Linux, and Wind River Pulsar OS. 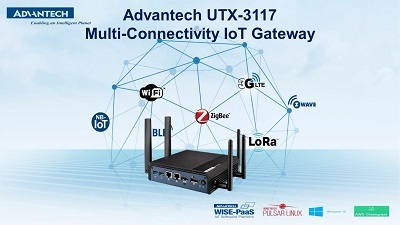 Furthermore, UTX-3117 has Advantech intelligent software WISE-PaaS integrated and is certificated with AWS Greengrass IoT solution to offer a total solution for bridging connectivity from edge sensors to the cloud. UTX-3117 integrates three RF modules in palm size dimensions, including one M.2 slot for Wi-Fi, one half-size MiniPCIe slot, and one full-size MiniPCIe slot for 3G/LTE, Zigbee or LoRa connection. It has a special double sided thermal solution and offers three independent RF modules to maintain maximum RF throughput in extended temperatures ranging from -20~60 °C. UTX-3117 offers five RF antennas to support three RF modules. These antennas are designed in optimized locations to prevent RF signal conflicts. UTX-3117 offers the best solution for outdoor or harsh environment IoT applications such as smart city street lighting control, smart retail control systems, factory automation and more. UTX-3117 is an ideal choice for transportation, logistics, and industrial automation with wide range power input from 12V to 24V DC. UTX-3117 comes with rich connectivity and expansion options including two RS-232 and RS-422/RS-485 serial ports for device control and wire sensor data aggregation. It offers two USB 3.0 ports, one audio jack, and dual gigabit LAN ports for general system control. UTX-3117 is designed with the latest Intel® platform which provides a 30% CPU performance enhancement and 45% graphic performance boost. It also includes a HEVC and VP9 HW video coding/encoding solution, which can play H.265 4K video on low power devices. UTX-3117 provides one HDMI and one display port which supports 4K UHD video outputs of up to 60 Hz on two independent displays for signage wall or TV banners. UTX-3117 bundles with Advantech’s WISE-PaaS solution on Microsoft Windows 10 IoT Enterprise, and Advantech Pulsar. WISE-PaaS provides more than 100 RESTful APIs including account management, device management, device control, event management, system management, and database management. WISE-PaaS offers centralized management and a dashboard builder for data visualization which allows customers to monitor and manage all connected devices. UTX-3117 is certificated with AWS Greengrass and Microsoft Azure IoT Edge. Amazon Web service and Microsoft Azure provide a range of suitable IoT programs and services for IoT applications. Rich I/O with 2 USB 3.0 ports, one RS-232 & one RS422/RS485 ports for data communication. Wide range power input support, 12~24V DC input for Industry and transportation.